adapter is an Opel Blitz (1975) with a multifunctional structure. 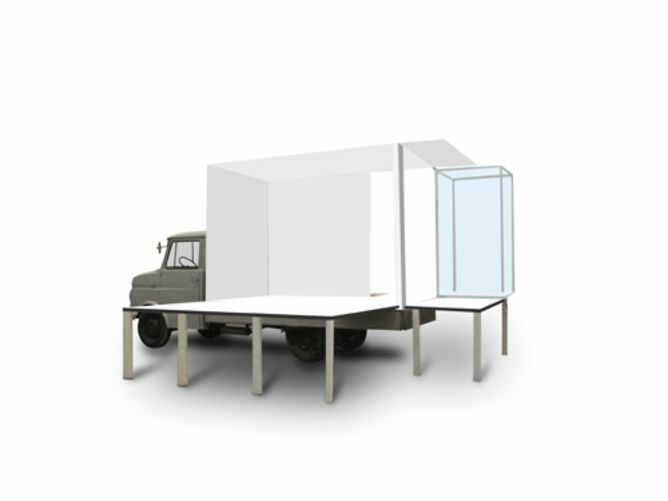 It can serve the purpose of a stage or an information/ action platform as well as an exhibition venue. adapter, the purpose of which is to foster the intermediation of contemporary art and to present it in a professional manner, can be perceived as a spatial extension of various project- and exhibition venues. Through this medium not only can individual institutions extend their venues but also, if need be, they will be able to connect to other areas within their region and even beyond that region. In this way, current art events can be transported beyond the borderlines, which will engage not only the interested parties but also those who are not necessarily into culture. Our goal is to launch adapter in the year 2014 and to operate it to full capacity for the benefit of various kinds of users in the field of culture and arts. adapter does not work in a profit-oriented manner but rather works on a cost-covering and future-securing basis. The exhibition and utilisation programme has been conceptualised primarily in accordance with curatorial criteria, not at all out of solely economic concerns. adapter is an Opel Blitz with multifunctional structure, which anyone in possession of a normal driver’s license can use. It is easy to steer and can be parked anywhere. A change of place is easily arranged for. 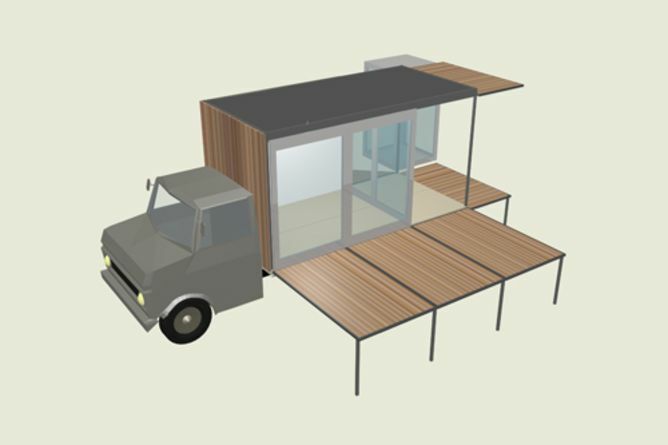 Its structure is transformable, offering several utilisation alternatives. 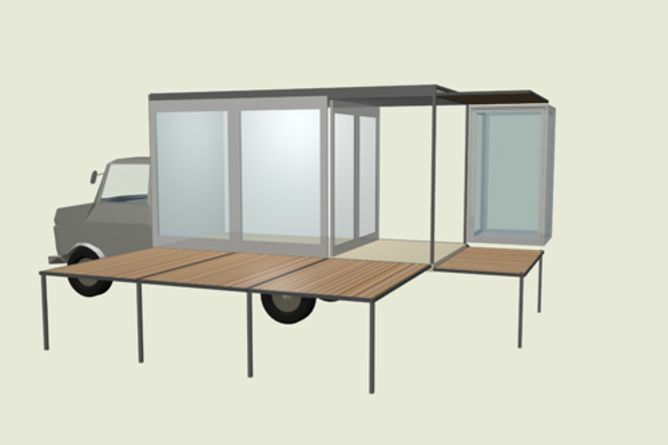 The extendable cross members offer variuos project facilities in both interior and exterior spaces. 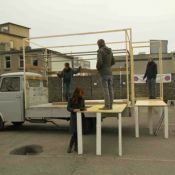 The rooftop can be used by artists, for instance, for the purpose of performances or object presentations. A flexible railing system ensures safety of the visitors in any of the utility forms. a platform for cultural facilities: adapter ist primarily a platform, which can be utilised by the existing professional art venues and cultural institutions all over Switzerland, be it musuems, higher education institutions or art houses. extending und networking: The users can extend their venues spatially as well as connect with the exterior spaces as farther as in other cantons. communication: The plattform can also serve as a mouthpiece, such as for a trade association visarte or art schools. Information can be circulated, or schooling can take place, defying geographical distances. This project ended successfully on 2/12/2013 16:00! You will receive a letter of thanks. You will receive a signed photo of adapter in its new dress with an invitation to the opening ceremony in 2014. You get an image painted by adapter for you with an invitation to the opening ceremony in 2014. You get an image painted by adapter for you with an invitation to the preview including a glass of champagne before the official opening ceremony in 2014. You will receive a copy of the original tirerelief of adapter (limited, signed) with an invitation to the preview including 2 glass glass of champagne before the official opening ceremony in 2014. You get the opportunity for a trip to the coutryside as a companion. Let us suprice you with an art picnic basket. You can be part of the maiden voyage of the adapter and your name will be immortalized on the vehicle. You get a partnership for one day with the club and you will be able to use the adapter for free. Your name will be immortalized on the vehicle and furthermore you will get an art surprise-egg. The association’s purpose is the mediation of arts and culture regionally and nationally. He manages and maintains a specially constructed vehicle and its spatial structure, as well as the integrated infrastructure. 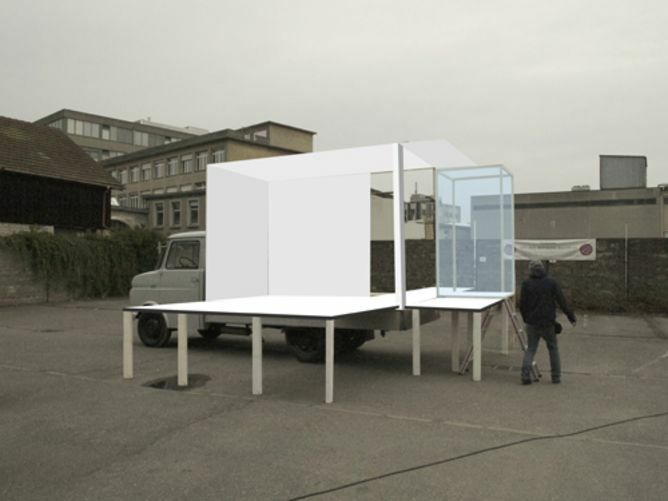 The aim of this mobile infrastructure is networking among the art establishments and artists so as a cross-border inter-cantonal cooperation in the artistic field.